We are all able to appreciate what a vital role water plays in our lives. If we view water from a different perspective we are able to understand a bit further as to what it is and how it can affect life. If you were feeling low on energy and you were to jump into an unpolluted mountain stream you would feel refreshed because the mountain stream would give you some of its energy. Jumping into a pool of stagnant or dead water is not going to be refreshing! 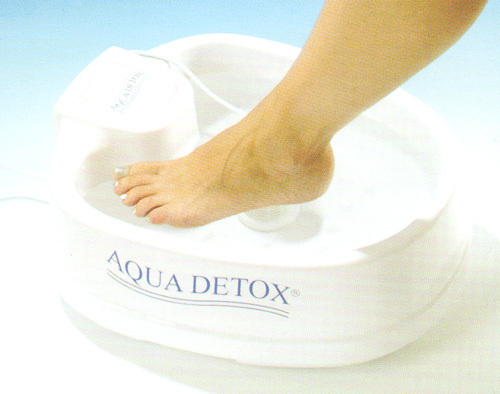 An aqua detox treatment encourages your body to release toxins through the pores on the sole of each foot. It also encourages the body’s natural healing process to be stimulated by raising the temperature of the body by approximately one degree. You place your feet in the AQUA DETOX apparatus and an array is also immersed in the water. This unit creates a flow of electrons, which imparts to the water a bio-energetic field, which corresponds to that of the person using the apparatus. This allows the positive and negative ions, with a gentle resonance, to travel through the body allowing the body to release. (Changes in the colour of water can be dramatic, but this is not always the case, and is not an indicator to the amount of toxins released, as there are other factors to consider).